January 25 Article entitled “I Quit” by Green Beret Master Sergeant Donald Duncan appears in Ramparts magazine. January 21 GIs United formed at For Jackson, South Carolina. January 31 Susan Schnall is court-martialed in San Francisco for actions which, the Navy said, would “impair the morale, loyalty and discipline of the members of the armed forces (and) conduct unbecoming an officer.” (See entry for October 14, 1968). February First trial of draft resistors known as the Buffalo 9. Around 150 University of Buffalo students and faculty picket the U.S. Courthouse, chanting, “Free the Nine — The Trial’s a Crime”. Defendants argue that it was necessary to resist an “immoral, illegal, racist, politically insane war on the Vietnamese people.” Charges include assaulting federal officers, as well as draft evasion. The jury is unable to reach a verdict on several of the defendants but Bruce Beyer is convicted and receives a three-year sentence. Beyer later goes to Canada and then Sweden to help organize fellow resistors and deserters. February 14 The first three of 27 Gls charged with mutiny at the Presidio are found guilty and sentenced to 14, 15, and 16 years at hard labor by a court martial at the San Francisco Presidio stockade (see entry for October 14, 1968). By this time, three of those charged (Blake, Mather, and Pawlowski) had escaped to Canada. On appeal, the long sentences for mutiny were voided by the Court of Military Review in June 1970, and reduced to short sentences for willful disobedience of a superior officer. Rowland, for example, was released in 1970 after a year and a half imprisonment. See The Unlawful Concert by Fred Gardner for a fuller description of the case. March Letters from Vietnam veteran Ronald Ridenhour results in a U.S. Army investigation into the My Lai (Mỹ Lai) massacre. National Draft and Military Law Panel of the National lawyers Guild files suit to protect the rights of GIs marching in Easter antiwar demonstrations. March 18 Reps Jeffrey Cohelan and Robert Leggett, both California Democrats, accuse the Pentagon of handing out “unconscionable, excessive, and unfair” sentences to soldiers convicted in a sit-down protest at the Presidio Stockade. Fort Lewis – Pvt. Isaac Barr, who had refused orders to Vietnam, is dragged on to a plane and shipped to Vietnam. March 28 Fort Dix – SP/4 Allen Myers is arrested for posting sticker advertising April 5th GI-civilian demonstration in New York. April 5 75-100,000, including 200 GIs, march against the war in NYC, 30 GIs join 30,000 marchers in Chicago. April 23 Fort Dix – Sp/4 Allen Myers is acquitted on charge of having put up an antiwar sticker and distributed unauthorized material. May 6 Fort Dix – Edwin Arnett, the first GI to be tried for desertion from Vietnam to a foreign country, is sentenced to four years at hard labor. May 15 Daily support of the Presidio swells to 5,000 as GIs, vets, and civilians protest sentencing of the Presidio 27. See entry for February 14. May 10-May 20 Forty-six men of the 101st Airborne as part of Operation Apache Snow (May 10- June 7) die during a fierce ten-day battle at ‘Hamburger Hill’ in the A Shau Valley near Hue. 400 others are wounded. After the hill is taken, the troops are then ordered to abandon it by their commander. The NVA (PAVN or VPA) then moves in and takes back the hill unopposed. 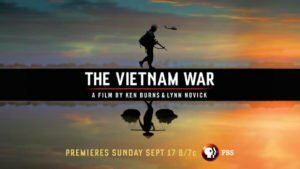 The costly assault, and its confused aftermath, provokes a political outcry back in the U.S. that American lives are being wasted in Vietnam. It is the beginning of the end for America in Vietnam as Washington now orders MACV Commander Gen. Creighton Abrams to avoid such encounters in the future. General Abrams discontinues the policy of “maximum pressure” against the PAVN to one of “protective reaction” for troops threatened with combat action, ‘Hamburger Hill’ is the last major search and destroy mission by U.S. troops during the war. Small unit actions will now be used instead. Following the bloody battle, soldiers offer a $10,000 reward in an underground newspaper for fragging the officers in charge. May 20 Army announces it is dropping charges against the Fort Jackson 8. May 22 Canadian government announces that immigration officials would not and could not ask about immigration applicants’ military status if they showed up at the border seeking permanent residence in Canada. Wright-Patterson AFB – Airman 1/c Larry Friedberg and Sgt. 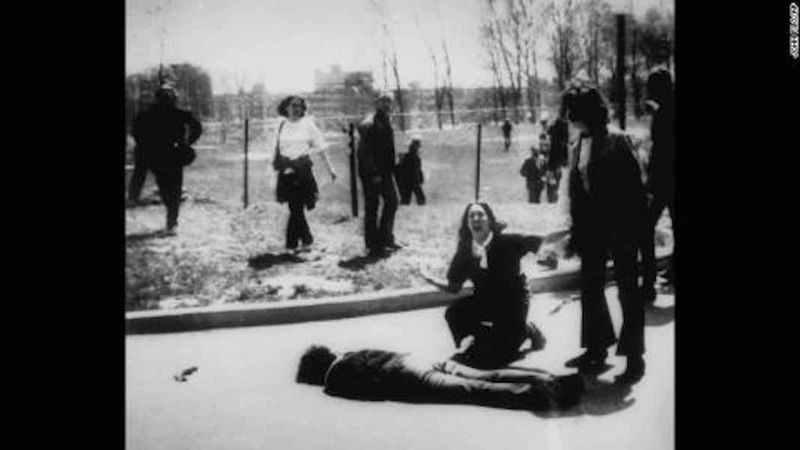 Rossarie Bisson are arrested for distributing leaflets announcing May 31 anti-war march in Dayton. Pentagon drafts Guidance on Dissent as a guideline in the handling of “dissenters.” The letter gives instructions to commanders on how to handle many facets of dissent ranging from possession and distribution of political materials, Servicemen’s Unions, and demonstrations to the publication of “Underground” newspapers. 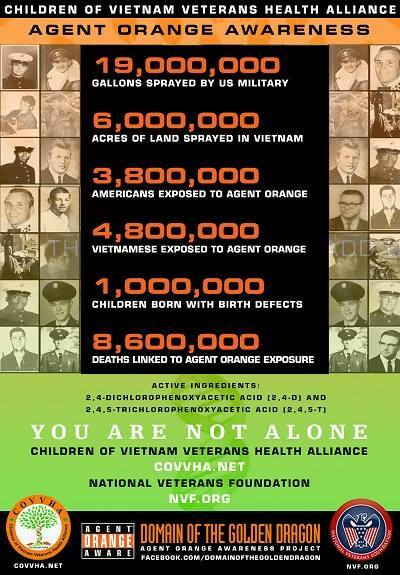 May 24 GIs and Vietnam Veterans Against the War (VVAW) organize an antiwar picnic in Riverside, California. June 5 More than one hundred imprisoned soldiers rise up against deplorable and inhumane conditions at the Fort Dix stockade in New Jersey. The prisoners are made up of AWOLs, Vietnam War resisters and conscientious objectors from working class and rural backgrounds. 38 men are charged with rioting and arson. Dubbed the “Fort Dix 38,” they face court-martials and as a result some of the men were sentenced to military prison. June 7 Fort Ord – 14 Presidio 27 defendants are convicted at General court martial, and sentenced to terms ranging from three to 15 months. 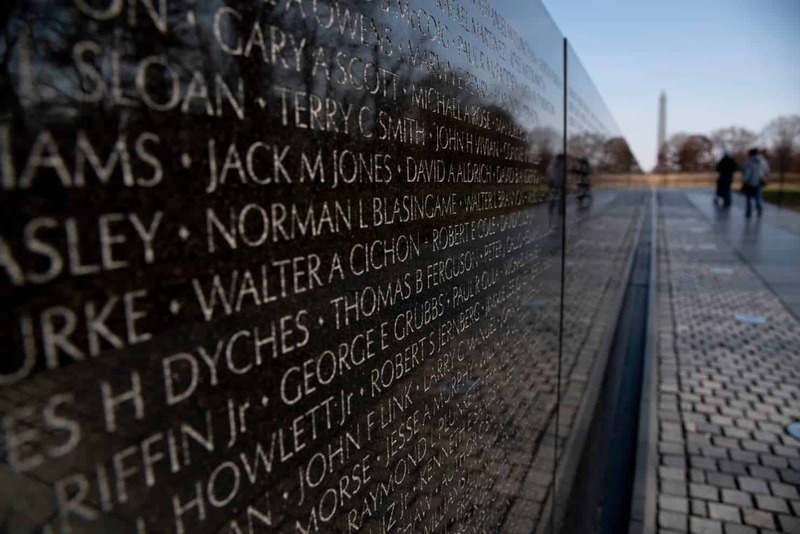 See entry for October 14, 1968, February 14 and March 18, 1969. July At Fort Ord, California, Pvt. Benny Amos immolated himself in protest against the war (he was not seriously hurt). July 4-5 First national antiwar conference involving GIs convened in Cleveland. July 2 Wrightstown – Sgt. Harold Hariston (McGuire AFB), Specialist 4 Hal Muskat (Fort Dix) and 2 staff members of the Fort Dix coffee house file a $1,000,000 damage suit against the commanding general of Fort Dix and state and local officials for harassment of employees and patrons of the coffeehouse. July 16 Activist David Harris is arrested for refusing the draft, and would ultimately serve a fifteen-month prison sentence; Harris’ wife, prominent musician, pacifist and activist Joan Baez, toured and performed on behalf of her husband, throughout the remainder of 1969, attempting to raise consciousness around the issue of ending the draft. July 20 At Camp Lejeune (North Carolina) a brawl between white and black marines at an enlisted men’s club spread over the 1st Battalion, 6th Marines barracks area. The fighting left fourteen injured and one Marine dead. July 22 The New York Times reports that the Pentagon admitted at a pretrial hearing for Navy seaman Roger Priest, that he had 25 military agents assigned to his case, that attempts had been made by these agents under assumed names to receive copies of his paper, and that special arrangements had been made with the Washington DC Sanitation Department to collect his trash and deliver it to Naval Intelligence. He is charged with soliciting men to desert, disrespect toward Gen. Earl Wheeler, J. Edgar Hoover, and Melvin Laird (a result of a headline in this paper, Om: “TODAY’S PIGS ARE TOMORROW’S BACON”), intending to interfere with, impair and influence the loyalty, morale and discipline of the military and Naval Forces of the U.S., and that “Roger Lee Priest, journalist seaman apprentice, U.S. Navy, did, at Washington, District of Columbia, on or about 1 June 1969 in the June issue of a pamphlet entitled “OM The Liberation Newsletter” wrongfully used contemptuous words against the Chairman of the House Armed Services Committee, L. Mendel Rivers. July 30 At a press conference called by the GI Civil Liberties Defense Committee, Bob Kukiel (who was discharged from the Marine Corps 3 months early on July 1 after requesting permission to distribute GI paper Head-On! at Camp Lejeune) refuted Rep. Mario Biaggi’s attempt to use clashes at Camp Lejeune between blacks and whites as an excuse for a witch hunt attack on all dissent in the military. Kukiel, who became opposed to the war while fighting in Vietnam, described the unlawful harassment meted out to him and other antiwar Marines and to anyone found with a copy of Head-On! 100 soldiers demonstrate against the war at Qui Nhon (Quy Nhơn). 35 GIs granted sanctuary in Hawaii for a month. GIs for Peace founded in Fort Bliss, Texas. August 6 Supreme Court Justice William Douglas orders Howard Levy be released on $1,000 bond. See entries for December 28, 1966, May10-June 2 and June 2, 1967 entries. August 25, 1969 Company A of the 3rd Battalion, the 196th Light Brigade, refuse to advance further into the Song Chang Valley of Vietnam after five days of heavy casualties; their number had been reduced from 150 to 60, one of countless mutinies in Vietnam. September 12 Honolulu – MPs raid a church, capturing 12 of 23 anti war GIs who have taken sanctuary there for 38 days. The other GIs escaped. September 14 Several hundred prisoners Camp Pendleton (California) brig broke out of their barracks setting fires leaving the prison in shambles before being suppressed by MPs wielding tear gas. October 1 Meade County Judge rules that Fort Knox coffee house landlord had right to evict coffeehouse for non-payment of rent, in spite of the fact that the coffee house staff had attempted to pay the rent. October 9 Fort Knox Coffeehouse is firebombed. Bad Kreuznach, West Germany – Base locked down to stop on-base demonstration. October 11 100 soldiers from Fort Bragg, North Carolina (mostly returned combat veterans) march in A Vietnam War Moratorium against the War demonstration Fayetteville, North Carolina. October 12 Led by 100 women, close to 10,000 demonstrators march from the GI coffeehouse Fort Dix in solidarity with the Fort Dix 38. See entry for June 5. 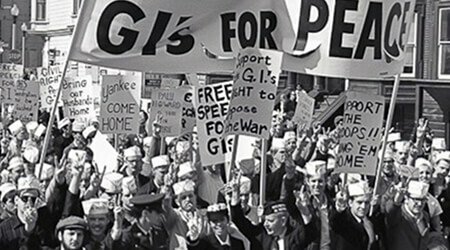 500 active-duty GIs march against the war in San Francisco. October 13 A group of GIs based around the Shelter Half use its facilities to produce the first issue of a new paper, Fed Up, followed a week later by a meeting on base to form a local chapter of the American Servicemen’s Union (ASU). When military police break up the meeting, the soldiers continue talking in the brig, and the ASU was born. The army eventually dropped all charges, and the newly formed ASU local, strengthened by its victory, grew to upwards of 75 members. The ASU and Fed Up organized not just around the war, but around radical issues that antiwar soldiers and the antiwar movement were drawn to: the ASU worked with the United Farm Workers to boycott non-union grapes and lettuce on base, and Fed Up featured articles on racism, imperialism, and capitalism. 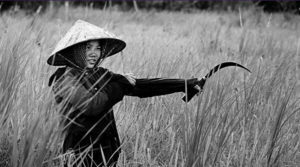 November Solidarity actions with the Vietnam Moratorium by GIs in Vietnam: in Long Binh, Pleiku, and Da Nang (Đà Nẵng). November 9 1,365 active duty GIs sign a full-page ad in The New York Times calling for an end to the war. November 11 100 GIs hold a Veteran’s Day antiwar demonstration in El Paso, Texas. November 13-14 GI Defense Organization organizes a National Conference on GI Rights in Washington DC. November 16 Soldier’s Liberation Front forms at Fort Dix, New Jersey. December Fort Dix – Bill Brakefield (Fort Dix 38) is convicted on charges stemming from the June 5 Stockade rebellion at Fort Dix and sentenced to 3 years at hard labor. December 8 Fort Dix – Terry Klug (Fort Dix 38) is acquitted at a general court martial of charges that he helped incite, and participated in, the June 5th riot at Fort Dix. December 14 5,000, including 1,000 GIs, march against the war in Oceanside, California, near Camp Pendleton. December 27 Columbia, S.C. – A federal Judge rules that GIs don’t have the Constitutional rights of free speech and freedom of the press. By year’s end, there had been at least 7 combat refusals in Vietnam (including at Phu Son, Binh Duc (Bình Ðức), Que Son (Quế Sơn), Cu Chi (Củ Chi)). In the US there were18 reported riots on military bases (Camp Pendleton Brig, four times, Fort Hood stockade, twice, Fort Bliss, Fort Riley Stockade, twice, Fort Ord stockade, Fort Carson, twice, Fort Leonard Wood, Fort Dix stockade, Camp Lejeune stockade, twice, Memphis Naval Air Station, Fort Bragg). 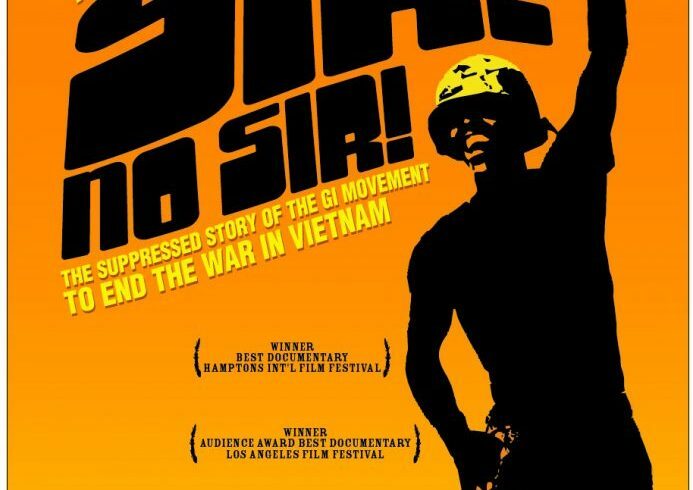 Sadly, the “Sir, No Sir” website , an excellent resource on the G.I. Resistance, is now offline. Could anyone contact Displaced Films to put it back up?